Three black teas and tea sandwiches (no crusts!) for this Tea Pairing 101 session. 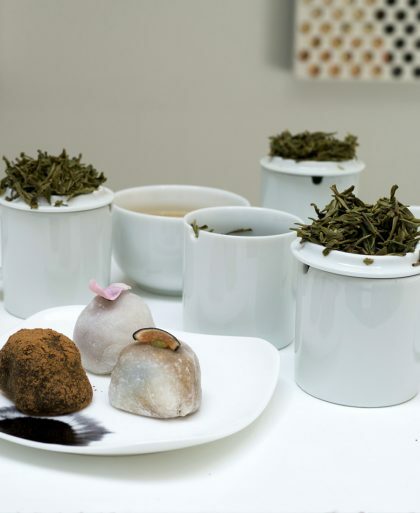 Each tea was prepared using a professional cupping set. Sara, Georgia, and I (we’re all tea bloggers) attended ITEI, a tea school based in Canada. 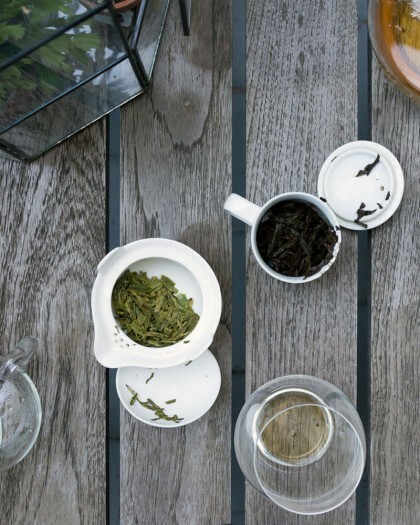 To keep practicing our steeping and brewing techniques and pairing know-how, we meet up for Tea Pairing 101 sessions. The last one was an oolong tea pairing where we worked out which fruit went best with oolong teas. For this one with black tea, we decided to pair it with tea sandwiches. I had Sara and Georgia over to my place in Downtown Manhattan and we spent 3-4 hours together nibbling tea sandwiches and drinking A LOT of tea. Ahem, as a huge fan of afternoon tea I personally loved this pairing. 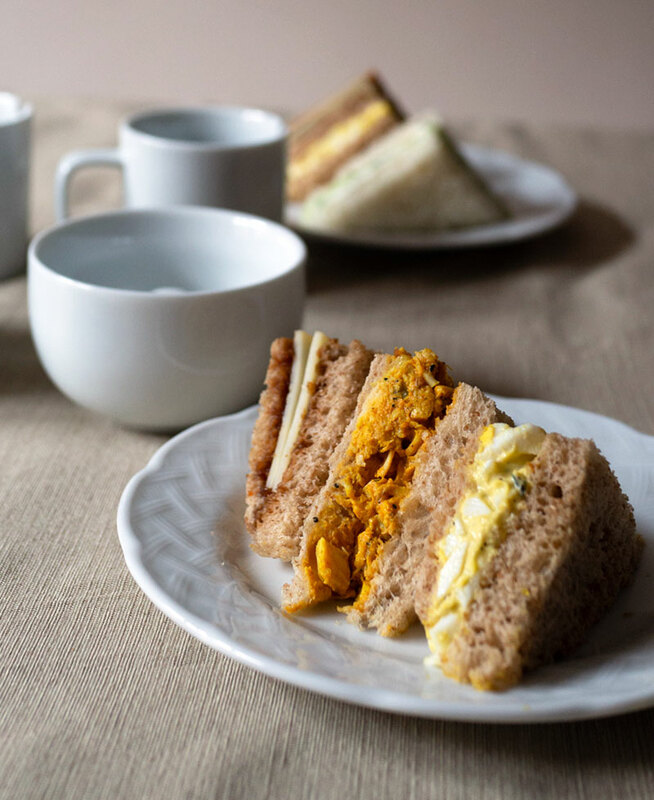 Over the years, I’ve shifted my tea of choice for afternoon tea (from greens to oolongs) but really black tea is the perfect match for tea sandwiches. You’ll notice that most afternoon tea menus have black teas as the largest selection and that’s because it’s the classic pairing. 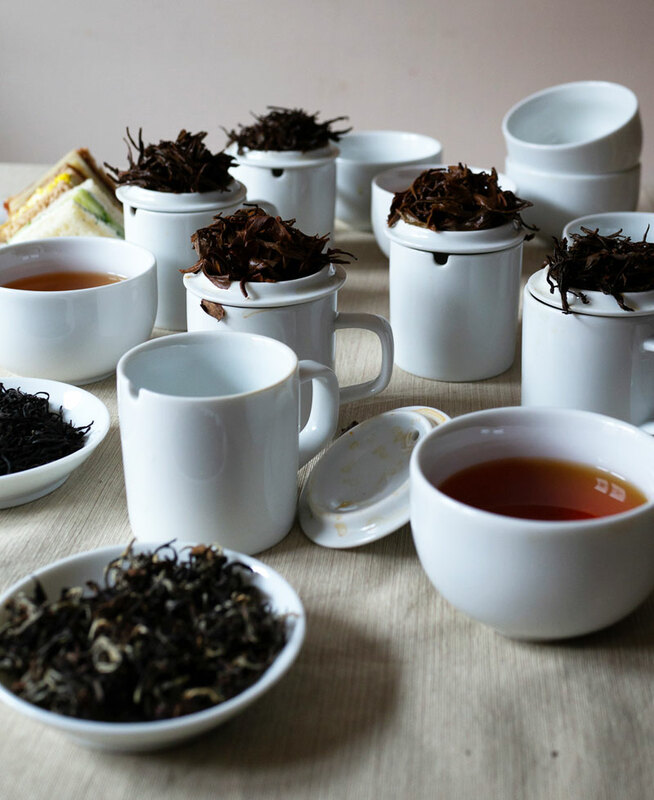 Traditionally, black tea from India or Sri Lanka were served at English afternoon teas. 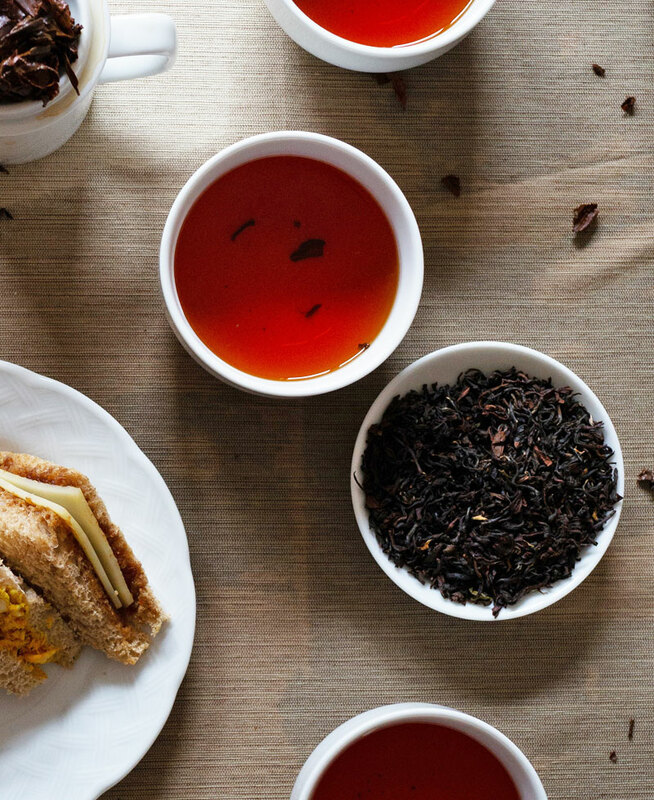 Black tea with its strong flavor with a hint of bitterness is great for savory tea sandwiches. It can hold up to strong flavors in your savories. If you eat a curry chicken sandwich with a white tea, the strong curry flavors will make the white tea taste like water. 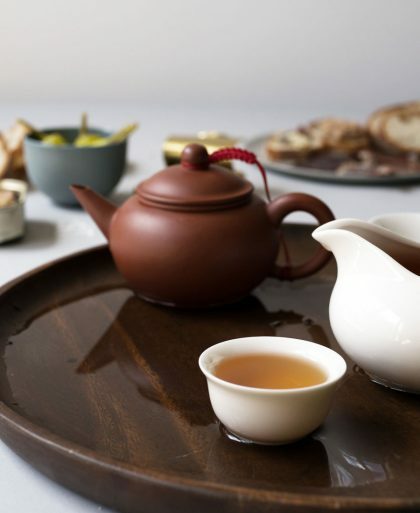 Black tea also the easiest tea to brew (and not mess up) since you just need boiling water. All other teas are more sensitive to water temperature. 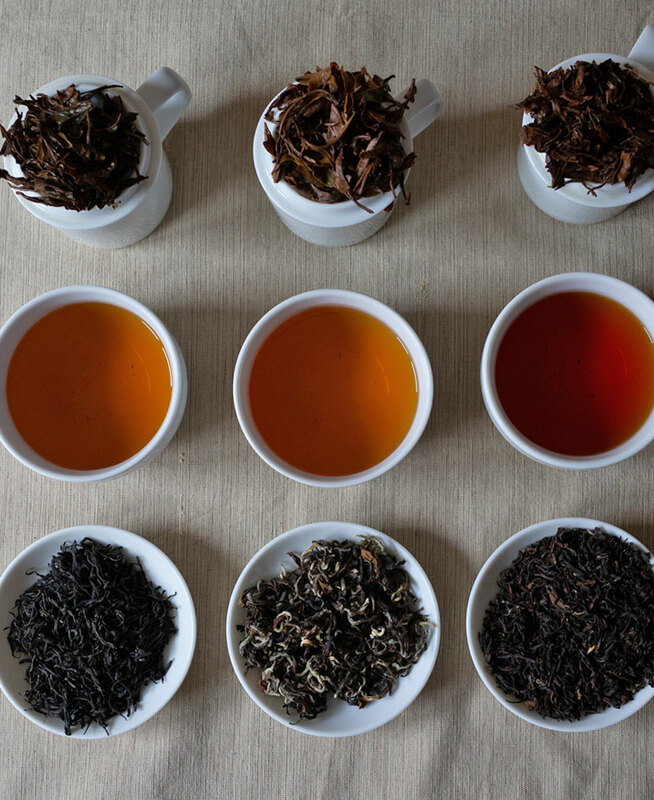 Earl Grey, Irish Breakfast, and English Breakfast are black tea blends. They’ve taken a pure black tea and added other flavors into them. Earl Grey is a black tea with bergamot oil. Irish and English Breakfasts are a mix of a few black teas like Assam, Ceylon, and Kenyan tea. 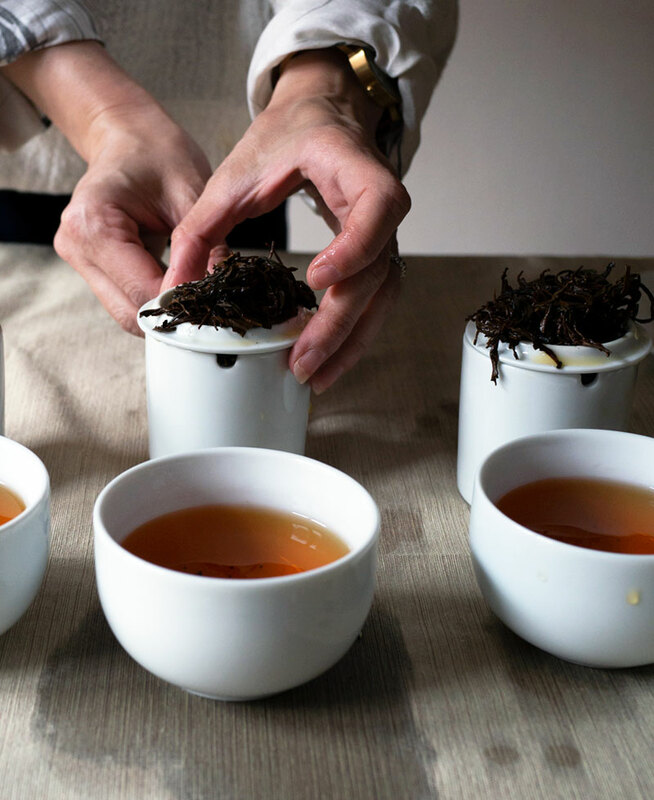 For our tea pairing, we steeped three black teas in professional tasting cups. We brewed: Lapsang Souchong from Joseph Wesley, Himalayan Supreme from Happy Earth, and a Second Flush Darjeeling from Harney & Sons. Black tea is called red tea in China, and you can see from the color of the steeped tea why it’s called that. Sara measured out (she’s the designated tea scale person) 3 grams of each tea and we steeped each for 3 minutes. We each had a selection of tea sandwiches. Sara and I had cheddar cheese with Brandston pickle, curried chicken breast with raisins, and an egg salad. Georgia is vegetarian so instead of the curried chicken breast, she had a classic cucumber tea sandwich with cream cheese and dill. Of course, all the crusts were cut off — they wouldn’t be tea sandwiches otherwise . With each tea, we would take bites from the tea sandwiches to see which one we liked best. For me, they all went well with each black tea. But, if I had to pick favorites, here are what I thought worked best. 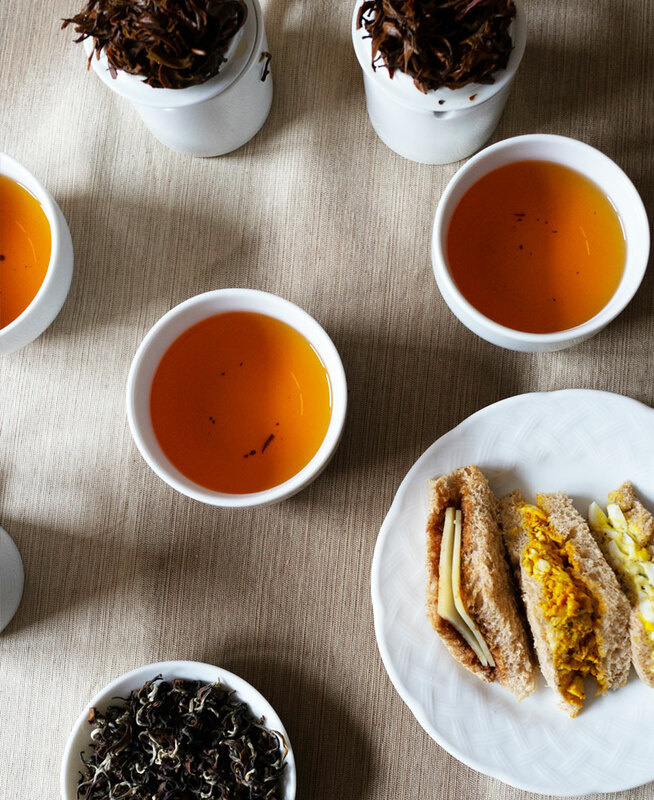 The Lapsang Souchong with its malty and smokey notes were a great match to both the punchy cheddar cheese tea sandwich and the bold curried chicken. The Himalayan Supreme with notes of honey and nuts really went well with the curried chicken sandwich. We realized the raisins in the curried chicken and the honey and nutty notes of the Himalayan worked great together. The Darjeeling had a lovely stone fruit flavor and the egg salad sandwich with the rich mayo paired best. The tea was slightly bitter but the rich mayo was just perfect. Three black teas and nine cuppings later, we have a glorious mess, as usual.